Perfect for longer, narrow lots, the Chesterfield house plan is a low-maintenance combination of brick and siding sure to accent any streetscape. 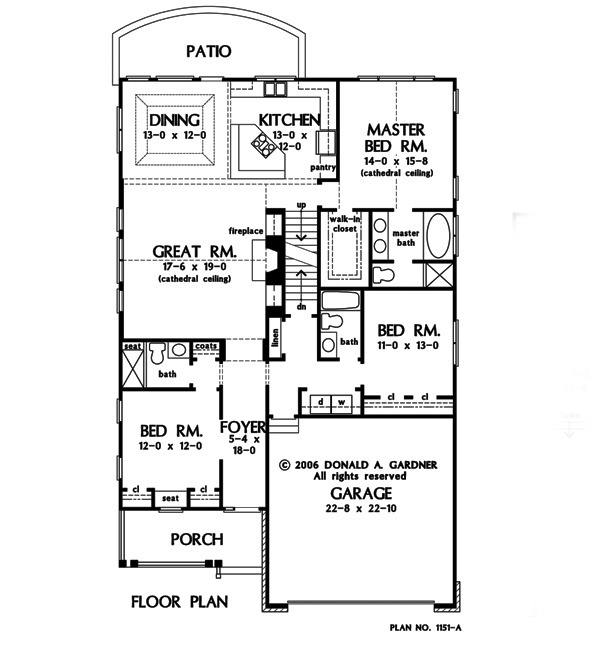 For families that enjoy entertaining, this home's floor plan was designed with you in mind. The dining room, kitchen and great room are all open to each other and the tray ceiling in the dining room grants formal flair to this space during mealtime. The master suite includes a generous walk-in closet sure to fit even large wardrobes. Dual sinks and a separate shower and tub provide a soothing way to relax at the end of a hard day. The study/bedroom features an adjacent full bath that is the perfect overnight suite, and a second bedroom also features its own full bath. 1st Floor: 1907 Sq. Ft. Bonus Room: 817 Sq. Ft.
House Dimensions: 41' 4" x 64' 6"
Great Room: 17' 8" x 19' 2"
Master Bedroom: 14' 0" x 15' 8"
Bedroom #2 : 11' 0" x 12' 0" x 9' 0"
Bonus Room : 13' 8" x 44' 6" x 8' 0"
Deck / Patio : 22' 0" x 8' 0" x 0' 0"
Dining Room (Tray): 13' 0" x 12' 0" x 10' 0"
Foyer : 5' 4" x 18' 0" x 9' 0"
Great Room (Cathedral): 17' 8" x 19' 2" x 17' 7"
Kitchen : 13' 0" x 12' 0" x 9' 0"
Master Bedroom (Cathedral): 14' 0" x 15' 8" x 13' 9"
Porch - Front : 17' 6" x 7' 0" x 0' 0"